Swedish security policy has experienced dramatic developments in recent decades. With the end of the Cold War, Swedish security policy could not identify any military threat to the country’s security, and so the armed forces were dramatically reduced. What remained of Swedish defence shifted the focus to international peacekeeping and peace enforcement operations. At this point it was said that Swedish security started in Afghanistan; the doctrine of Swedish security policy was accordingly referred to as the ‘Afghanistan doctrine’. But in 2008 the Swedish Parliamentary Defence Commission (För­svars­beredningen) presented a report which, for the first time in many years, recognized what might become a new security context. The Defence Commission argued that the litmus test of Russia’s choice of future path would be how it came to behave toward former members of the Soviet Union over the coming years (Försvarsberedningen 2007: 36). Accordingly, many Swedish politicians and commentators saw the Russian–Georgian war later that same year as proof of a more assertive Russia (see Brommesson 2015). After 2008, tension levels in Sweden’s neighbourhood have risen – including what the Swedish Armed Forces have deemed to be violation of Swedish territorial waters by a foreign power, confrontational behaviour in the airspace over the Baltic Sea and reports of heightened levels of espionage in Sweden. Against this background, the Swedish security policy has gradually refocused and has once again defined the defence of Swedish territory as its first priority. Military spending has increased, various types of bilateral and multilateral cooperation within the defence area have gained momentum and there is now lively discussion on what Sweden’s future secur ity policy should look like. policy cooperation as points of departure for alternative paths for Swedish security policy. 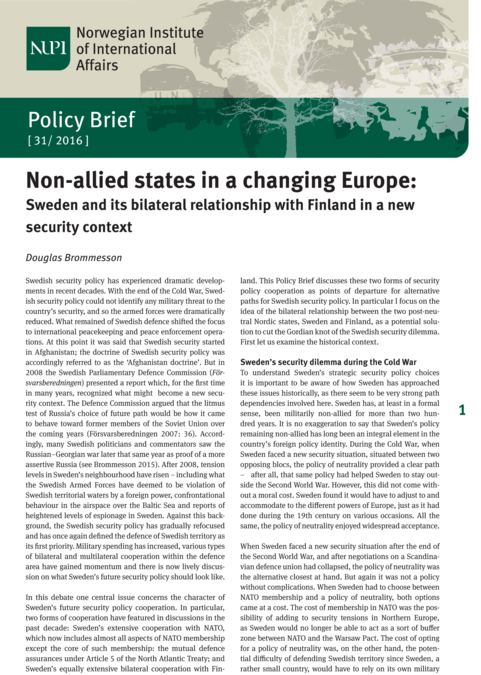 In particular this policy brief focuses on the idea of the bilateral relationship between the two post-neutral Nordic states, Sweden and Finland, as a potential solution to cut the Gordian knot of the Swedish security dilemma.